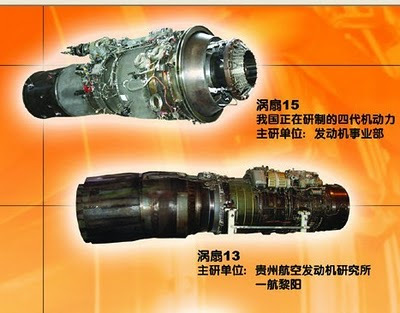 China Defense Blog: Switcharoo: Multiple Engine Types for China's J-20 Stealth Fighter? Switcharoo: Multiple Engine Types for China's J-20 Stealth Fighter? Our intrepid forum members have noticed there appear to be two different sets of engines powering China's J-20 stealth fighter as it undergoes testing at Chengdu. Judging by the nozzle petals, one engine set seems to be the Russian AL-31F, possibly the 117S upgrade variant. The AL-31F powers some Chinese J-10 and J-11 fighters, while the 117S variant powers the Russian Su-35 and is the interim powerplant for the T-50 PAK-FA. The 117S was approved for export by the Russians a few years ago and some sources indicate China has at least negotiated for them if not obtained some. The other petal set looks like the indigenous WS-10A engine. The WS-10A powers new-build J-11B fighters coming off the assembly line at Shenyang, and is reportedly in use on the first J-10B aircraft. There are other variants of WS-10 reportedly in development. China's AVIC I aircraft industry announced in 2009 it was developing the WS-15 engine for use in China's next generation fighter. Some components for the engine are known to have completed development, but there have yet been no indications of a complete operational WS-15 engine. It seems unlikely the J-20 would undergo initial testing with an unproven WS-15 engine. The latest J-20 photos show a prototype equipped with what appear to be WS-10A engines. If standard AL-31F engines were used initially, it would have likely been as a risk reduction measure. 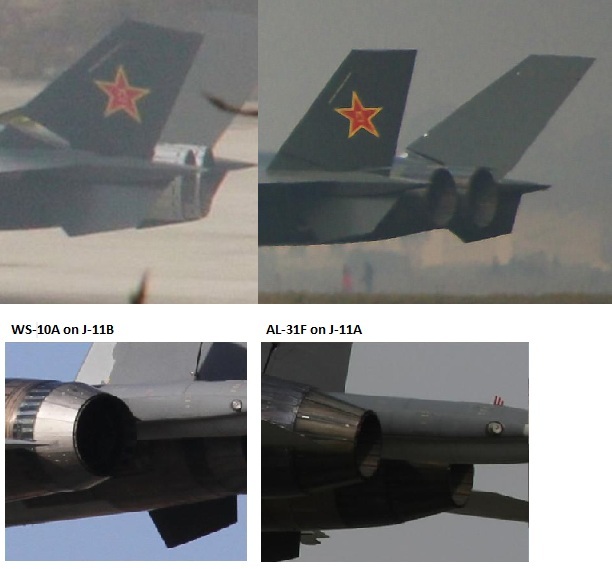 However, WS-10A engines are also a known quantity and in service with the PLAAF so it seems unlikely for J-20 to undergo test with the standard AL-31F now. There are some tantalizing rumors about more than one prototype and previous secret J-20 flight testing that provide possible answers, but I'll leave these on China-Defense.com forum. Is it an engine switch or is another plane? Any distinct markings on the plane (001,002)?